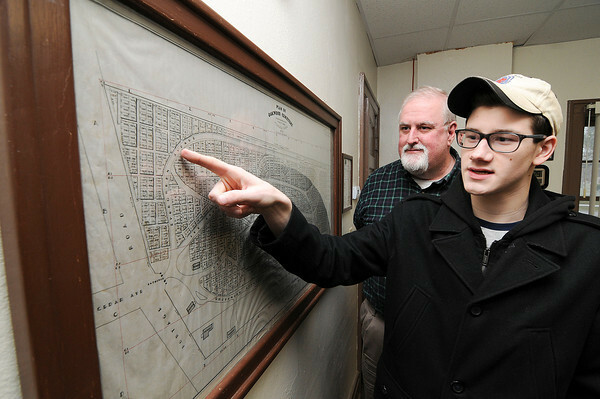 James Neiss/staff photographerNiagara Falls, NY - Niagara Falls High School student John Goodnick and member of Boy Scouts of America Troop # 841, which meets at St. John de LaSalle Church on Buffalo Avenue, shows Oakwood Cemetery Director of Operations Tim Baxter locations of veteran graves he and his team found, part of his project to become an Eagle Scout. To become an Eagle Scout, Goodnick must create and complete a project that meets a specific criteria. The project is then presented to the Boy Scouts of America Board of Review. Goodnick chose to do a project which will have great value to the historic Oakwood Cemetery on Portage Road in Niagara Falls, NY. “The Oakwood Cemetery Veterans Identification Project” took one year to complete. It included locating and recording US Military Veterans buried in Oakwood Cemetery.